Assemblyman Chad A. Lupinacci (R,C,I,Ref.-South Huntington) recently joined the Commack South 12U Baseball team to congratulate them on their District 34 Championship. After winning the championship, the team is qualified to move on to the four-team Suffolk County Championships in the coming months. 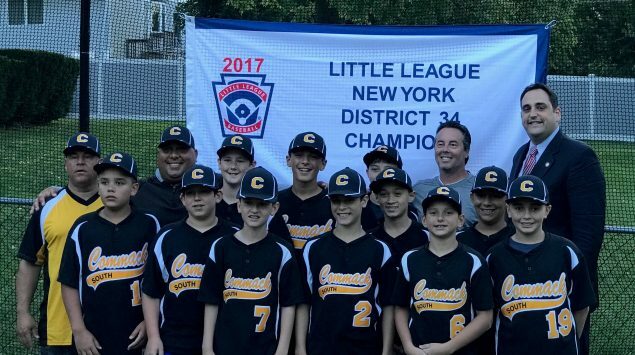 “In order to achieve prominence on the baseball diamond, a team must work together from the first practice through the final inning, and your win is a testament to the dedication, hard work and perseverance you’ve shown this entire season. Baseball Team and their coaches at a celebratory BBQ on Friday. “I am sure you will face many challenges and intense competition as you advance through the Suffolk County and New York state playoffs, but I am confident that your best baseball is yet to be played. On behalf of the state of New York, I offer my heartfelt congratulations, best wishes and I will be cheering you on as you continue on to Williamsburg,” Lupinacci said. On Friday, Lupinacci awarded each of the athletes with a New York Assembly Citation.